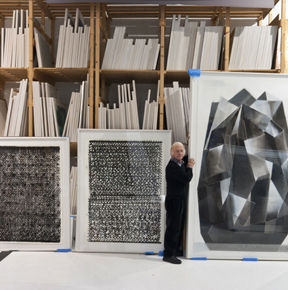 Within the rich graphical oeuvre of Heinz Mack one has to differentiate between original graphics and graphical reproductions. 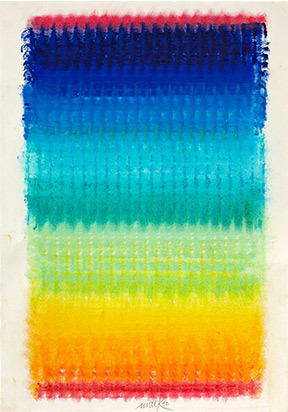 The production process of original graphics – drawings with India ink, pastel and/or chalk – allows the artist a greater degree of spontaneity than painting or sculpture. 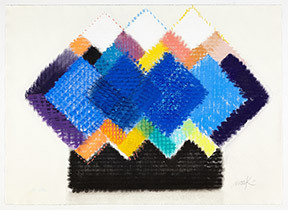 Heinz Mack also appreciates the inner logic and discipline, which can be made visible in a good drawing. That is why he once called his drawings "the grammar of my art" and “the language of my hand”, because they express the movements of his hands, his flow, his rhythm and to a certain degree – rather unconsciously – his feelings. The first graphical reproductions date from 1957. Heinz Mack experimented a great deal until around the beginning of the 1980s. He produced collage-like works, silver or gold embossings, serigraphs on glass, aluminum or ultrathin foil on two-color montages. Mack also used new printing materials such as Iriodin or gloss paint. Since approximately 1990, the print graphic genre has been determined by classical techniques such as serigraphs, lithographs, and wood and linocuts. An original graphic was used as a template for a screen print. To this extent, the original graphics and serigraphs show optical similarities. By contrast, the wood and linocuts, as well as the lithographs, have been derived from an individually manufactured printing block.